Rob had a lot of online friends. As a man who spent most of his adult career traveling from state to state, even country to country, never landing in one place too long, there were few elements in his life that were constant. But his online activities were. He was online meeting new people back before most of us had personal computers. In short, he was comfortable online. He was well-spoken, smart and polite, so friends were always easy to come by this way. Rob shows off his Chris Nethery’s Russia Revealed design on a beach towel in September 2017. Not too many years ago, Rob decided to look into Twitter as a means to expand his audience. See, what he really wanted to do was to write. He wanted to share his life with the world, from his three dogs to his recipes to his travels to his politics… So he checked out Twitter in an effort to increase his reach. His handle was meaningful to him and a variation of his long-time screen name: akula_51. In looking over the following screenshots of conversations, you will see this handle when he is being addressed or spoken about. Early- or mid-last year, Rob went to work on a website for Chris Nethery, a specialist in Russian Active Measures. Chris Nethery’s Russia Revealed (www.russiarevealed.com) website was built by Rob and he was proud of it. I called Chris a day after Rob died. In speaking with him, I understood immediately why he and Rob got along. Chris is quick to laugh, smart as a tack and passionate about his work. The buzz on Twitter surrounding Rob’s death was immediate after speaking with Chris. The news was shocking and not everyone was kind. My friends did a great job of deterring me from interacting with anyone there. It was a good thing; I wasn’t thinking clearly enough to even consider engaging these virtual strangers. And at the time, I felt like many comments were attempting to bait me into giving information that I wasn’t ready to share just yet. When Rob died, members of the Resistance and Team Patriot pointed to the other, assessing blame for trolling him to suicide. Both were guilty as sin. I’m told and readily believe that Rob was friendly with folks on either side. But Rob also had critics on either side. I can only assume that insecure people didn’t care for the fact that he was outwardly balanced, well-informed and kind. So those people, and the people who “serve” them treated him in some not-so-nice ways. I’ll start with the Resistance first. It’s been hard to determine who leads this group on Twitter, as the most vocal of them is a lunatic who has managed to alienate some of her most ardent supporters of late. It seems her methods of opposing Twitter critics or those who would dare disagree with her are less-than-ethical. Some would call them downright evil. 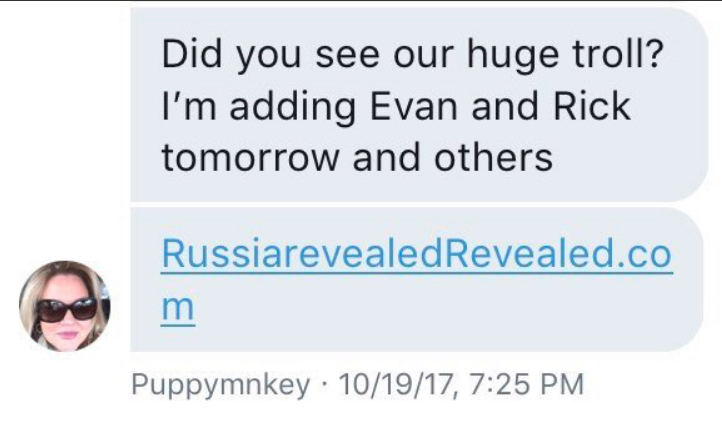 Robin Brenizer had some indirect contact with Rob by allegedly creating a site that mimicked the www.RussiaRevealed.com site he built for Chris. 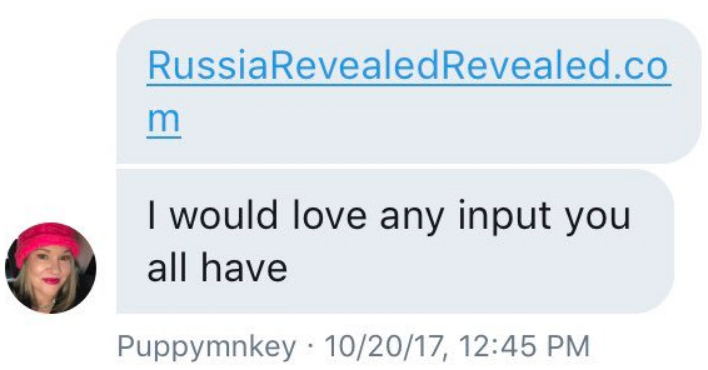 The fake one was RussiaRevealedRevealed.com, and it was meant to “troll” (her word, see above screenshot) the people supposedly opposing the Resistance, Chris Nethery in particular. It has also been asserted that she and her affiliates also created a fake Twitter account meant to look like Rob’s. I haven’t been able to verify that claim. 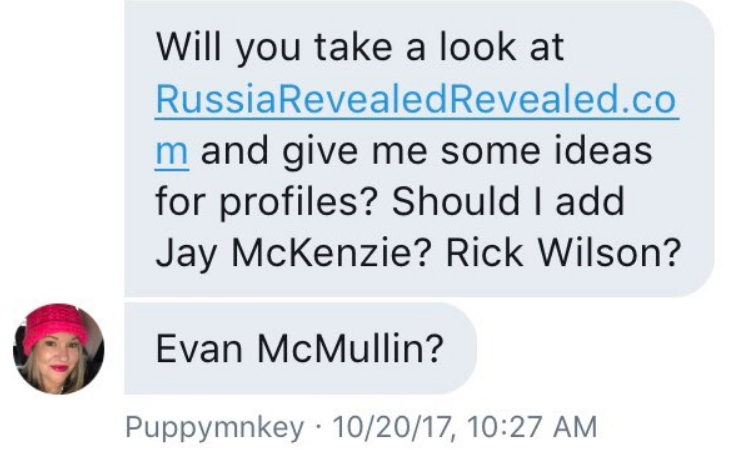 11/10/17 capture of published/trolling RussiaRevealedRevealed website bio. Fake bios of Team Patriot, and those connected with them, like Rob, were created and featured on a page of “contributors” on the spoof website. (See image left, dated Nov 10, 2017.) Taking the time to build the site and then make fun of people affiliated with it was a nasty little thing to do and Rob mentioned it to me at the time it happened. We both marveled at how petty people must be to take the time to do something so stupid. What small lives they must have. Sad, sad, sad. So many people have turned their backs on Brenizer and her closest cohorts for their distasteful behavior and proof of their villainy, acts which lack creativity and are seemingly never-ending. This transgression seems to be one of her lesser misdeeds, but that’s a post for another day, if I can even stomach the information I’m bound to uncover. I doubt I’ll be up for that. Ever. She was kind enough to pepper me with messages one fine day (see screenshot) when I was at work, apparently not getting that not everyone is on Twitter 24 hours a day. None of those messages received a response. Apparently it’s against the law not to call someone back when they demand it. Who knew? My suggestions for her: get in therapy or get a new therapist and get off social media. Life is too short to be that miserable. It takes a toll and not everyone has the constitution for it. Unfortunately, people still seem to follow her, but I can’t for the life of me figure out why. Perhaps they’re paid; it’s the only explanation that makes any sense. But what do I know? As easy as it is to believe that many people claimed Rob as a “friend” after his death, it has not escaped me that many of the same people expressing their condolences and sorrow were pretty awful to him in the past. I’ve been told that much of the proof of online harassing was wiped out when news of Rob’s death spread. As a friend says, “light scatters the roaches.” And the showboating is and has been epic on Twitter; everyone is a star these days, you know? Not. <Yawn.> Below are just few examples of the nasty things people say. My favorite has to be the Jumbo Sandberg guy saying that he and his crew are the only ones speaking the truth about Rob. The cojones on that guy. It’s clearly a sock account (secondary account, fake name), so it’s not even someone who’s using his real name, expecting folks to accept his (anonymous) word because…? Uh, helloo! Wife over here – with Rob’s life story, theories, passwords, last words & wishes, everything – right here, folks. No need to look to others at this point because others have proven they don’t have the ability to tell the truth if it is in conflict with what their objectives are. My objectives are pretty clear: Rob asked me to tell his story, so here I am. The same Jumbo Sandberg was also keenly interested in my BFF, who dared ask questions and speak her mind on Twitter. This veiled threat got my attention and received a swift response. What a coward. 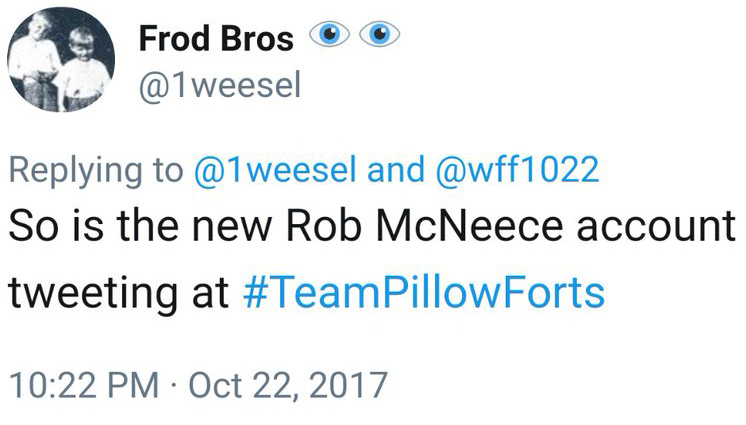 Team Patriot now claims Rob as one of their own, but not so long ago, their public (and unfortunately, incredibly vocal) face quashed that idea with extreme prejudice. I am posting the conversation as it still appears on Twitter today. Why would they claim him if he wasn’t really a part of their efforts/team? What would be gained by doing that? Even those truly close to Rob will say that Rob was not a part of the team, but suggest that had he lived, he might have eventually been accepted into the fold. Some suggest that Team Patriot wanted to deflect attention from their leader, Louise Mensch, who clearly had a bone to pick with my husband and whose followers joined her in harassing him. It was well-known her distaste for him, and her followers were quick to jump on the bashing bandwagon time and time again. Louise calling Rob “Vlad”, a stupid way of suggesting he’s with the Russians. And her super-charming follower piling on. If you’re like me, your next question is, “Who is Louise Mensch?” Well, in short, a former politician with a penchant for way-out-there conspiracy theories and f-bombs. I guess she was a former member of Parliament? I could look her up but I really don’t care who she is. She has upwards of 250,000 Twitter followers and Tweets roughly 50 times per hour. In short, she has too much time on her hands apparently. And, boy, does she hate the Russians. Were her followers afraid she could be named in a lawsuit? Is that why they laid the blame for his suicide on anyone but her? They’re not telling. Having become acquainted with several of her underlings, I hope that this theory is false, but there seems to be no other explanation. In short, their work means more than my husband’s life or suffering. What a sad display of humanity from a group so publicly complimentary of their friend, not to mention, a group so vocal about their pursuit of truth. Blinded by allegiance, knowingly choosing the wrong path. Doesn’t sound like a group Rob would have ended up siding with. I’m now confident of that. Unfortunately for their “leader” (and those associated with her), she was misinformed when he died and made a most ignorant statement regarding Rob’s harassers and death (below). “After he died (from trolling and not from my opposition; he left a note, per his friends, saying so); mutual friends told me his pro stance was NOC for research. In which case, he wouldn’t mind, and would expect patriot opposition.” – Louise Mensch on Twitter, 19 Nov 2017. Basically, she’s suggesting that 1) yes, he did kill himself as a result of being harassed online, 2) he had it coming, and 3) her Twitter enemies were to blame for his suicide. Doubling down on bad information is such a sad situation for someone with the kind of following and resume she has. I sure hope this isn’t a blemish on her reputation, but I fear it has the potential to be. The fact is that Rob DID, in his 3-page suicide note, mention the accusation that he was a Russian spy. And that was the only SPECIFIC claim he mentioned. As of yet, no one can produce any evidence that anyone not associated with/following Ms. Mensch also made that accusation. Not everyone will understand the devastation that a true patriot like my husband would have felt at being accused of being the one thing he detests the most. No one loved their country more. The mere suggestion in a hugely public forum by someone of her political position is a blow. And depending on one’s state of mind, it can be a fatal one. The “You’re RIS!” finger-pointing to anyone in disagreement with her is a ridiculous and common course for her to make, I’m told, which we all know diminishes its meaning every time she’s wrong. I can only imagine how often that is. The meaning of this can only be guessed at. Many suggest it’s a celebration. Others, a threat. 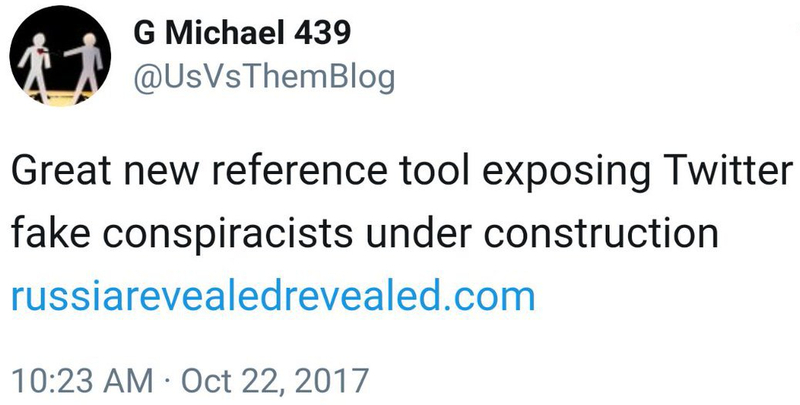 One Twitter screenshot shows Mensch referencing her accusation to Rob that he’s “RIS” two months after the initial conflict. She summons someone unrelated to the conversation, presumably to jump in on and restart the conversation/pile on further. Not many would argue that this would be considered harassment. Why double back to a brief conversation months later? Unless you intend to further humiliate them or berate them publicly? But now that I think of it, after you’ve harassed a man who commits suicide, is it (legally) possible to still be “harassing”? In any event, it’s petty and it’s indicative of someone with an obsessive personality, at best. Gosh, what would our world be like if people focused those kinds of energies on sharing love and happiness instead? Where people were lifted up instead of metaphorically smacked around? Louise deserves more than a cookie. I would recommend 3 squares per day courtesy of the Commonwealth of New York. But it gets even uglier. Check out this tweet, where she awards herself a “cookie” for identifying Rob as RIS two days after he died. Celebrating the death of my husband? Could I possibly be reading that right? Or, if we give her the benefit of the doubt, at best she’s harassing him further and doesn’t know he’s dead? The time after his death is all kind of a blur, but I do remember wanting to vomit when I saw this right after he died. Again, kudos to my friends for keeping me away from Twitter until I was strong enough to deal with the information appropriately and intelligently. I still have a physical reaction to this particular declaration. And guess what? No apology. Nothing. Just smug statements that further highlight rampant insecurities. This “bobs_house” guy (right) even suggests I’m pretending to be Rob’s widow in order to divide the Resistance? Gosh. Don’t people realize that some of us actually have real lives? In the days since his death, I have worked with a lot of incredible friends and supporters who agree that mental healthcare is no laughing matter and needs our help. I continue to speak out on Twitter, where I honor my husband’s memory and legacy by taking a measured approach, and exercise kindness. The leveled-out approach is not always my knee-jerk/natural response so this has been an exercise in grace and patience. There’s a certain strength in maintaining composure when everyone around you behaves like banshees though. I feel like he would be so proud of my restraint. And I can’t overstate that I hope others, in the wake of Rob’s story, take a more measured, balanced and appreciative approach to discourse. Our world is ugly enough; I’m tired of the nastiness people seem to think they’re entitled to. They’re not. And the ends don’t justify the means. Ever. If you’re breaking rules to make your point, your adversaries aren’t the problem, you are. Rob told me, in his last note, that he knew I’d go on and accomplish many things in my life without him. He said such lovely things that I will take with me the rest of my life. I hate that he’s right about life moving on, but I just can’t let him be wrong. I believe that the kinder, gentler approach has helped me to bring positive attention from many directions, including members of the Resistance and TeamPatriot, to the fund set up in his name. We are on tap to help at least four individuals get the mental health oversight and therapy that they need through a local facility. AND we continue with a monthly event (Mental Health Monday) that Rob’s favorite local restaurant, Morning Day Cafe, holds for those needing a mental health break/recharge. Collectively, contributors have raised over $7,000 so far, and that wouldn’t have been possible without the Twitter community. So I know that there is good there, but so often it’s overshadowed by the bad: the paranoid, the deviant, the bots, the infighting and the showboating. New Twitter friends who genuinely want the truth exposed at any cost have been incredibly helpful in bringing this information to light and I owe them a huge debt. I feel lucky to have come across such good folks. But I know, just like Rob did, that if you look for or expect goodness, you’re bound to find it. *The information contained in this feature include screenshots chiefly from conversations conducted on Twitter. I cannot verify the legitimacy of all of them, although I personally screenshot/collected several from live pages and current tweets and believe all provided images to be authentic. I implore you to do your own research if you’re so inclined. *Side note. I’ve been informed that Ms. Brenizer is a nobody in the #Resistance, a vast effort. I don’t disagree with that, but for the purposes of this conversation, we can agree that these two people are the chief drivers of bad conduct towards my husband from either direction as outlined above.